Location location location! Tranquil cottage sleeps 6 (5+baby) and welcomes well behaved dogs, with secluded garden built c1900, only 500 metres from Lac de Guerlédan, the largest lake in Brittany. This delightful stone cottage provides comfortable accommodation for up to 6 (5+1 baby) and is a less than 1 km away from the popular Lac de Guerlédan, a stunning lake 7 miles long that provides an abundance of activities for couples and families of all ages. 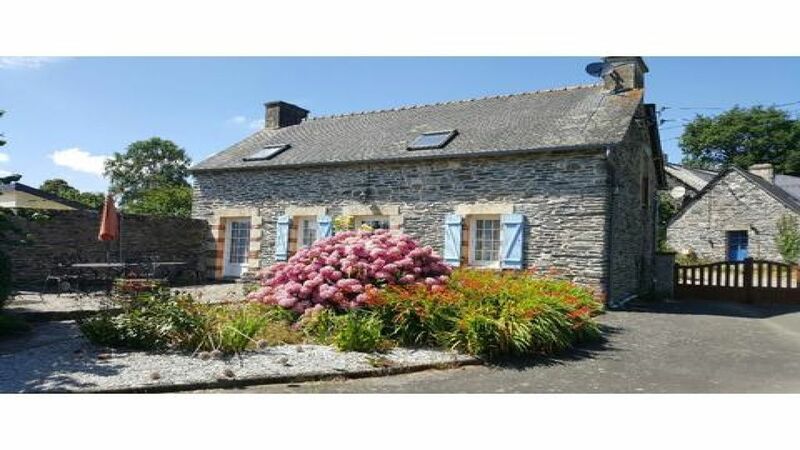 The property is in the heart of Brittany in the hamlet of Kergoff, tucked away up a lovely lane providing beautiful views and is within walking distance (1km) to the village of Caurel. Caurel has a 3 restaurants and cafe/bars and a wonderful glass making workshop and gallery where you can book a half day workshop and take home a piece of your own glass work. There are numerous things to do in the area and the cottage is perfectly situated for those that love lakes and watersports. Guests could also bring their speedboat as water-skiing is allowed on the lake (the French champion) used to train here. There are at least 5 restaurants around the lake, 3 of these are within 1km walk of the cottage. There is a cycle track accessible, 500m behind the Cottage. There is no shortage of activities from swimming, skiing, canoeing, pedloes, fishing (not on Lac de Guerledan until 2018 as the lake was drained in 2015, the fish were re stocked which is now re-establishing itself but other numerous places locally to fish), horse riding, quad bike hire and for the less energetic, plenty of wonderful cafes and restaurants to watch these from! You are welcome to bring your speedboat for use on the lake! Mur de Bretagne is a small town only a ten minute drive away and here there are supermarkets, shops, restaurants, markets, banks, post office and church and of course the wonderful boulangeries for delicious bread and patisseries! You can also walk or cycle into Mur de Bretagne along the cycle track close to the cottage which was once a rural railway line. It goes for about 15 km to Mur de Bretagne in one direction and 45 km in the other direction to Carhaix. The Brest/Nantes canal is about 2 miles away (it runs into and out of the lake). The tow path is flat and suitable for walking and cycling. A little further away is the the larger historic town of Pontivy, approximately 25 minutes drive from the cottage. Pontivy has a very good market each Monday and plenty of shops, supermarkets and restaurants. •	Two bedrooms upstairs; one large double bedroom and a further bedroom with a triple sleeper containing a double bed with a single bed on top, providing flexible accommodation options. •	Further sleeping options include two cots (see picture) and a fold out Z bed, suitable for a child or adult. The cottage comfortably sleeps 5 adults plus a baby but this allows even greater flexibility if required. •	There is a private enclosed south facing garden that provides a wonderful sun trap. Relax and use the patio garden furniture (two loungers also provided) and enjoy the evenings with a glass of wine from the complimentary bottle of wine the owner provides, or why not try a local apéritif! You can also enjoy the peace and quiet and use the B-B-Q provided and dine outside. •	A ground floor "wet room" has recently been installed . There is a shower, washbasin and WC. Upstairs is a separate WC and washbasin. •	The kitchen is well equipped with cooker, kettle, toaster, microwave, dishwasher, fridge/freezer, washing machine, iron/ironing board and all the necessary kitchen utensils. There is also a dining table in this area and a highchair is also available. •	The lounge has a comfortable three piece suite, with recliner function so home from home comforts and a lovely granite fireplace, perfect for cosy evenings in front of the fire. For winter lets, October - March, one basket of logs is provided. The lounge also has a TV with English channels, (no French channels available).dvd player and CD player. There is a large selection of books and games for indoor use. A BBQ and outdoor furniture is provided. Private parking; is available. Tthe parking is perfect so you can stroll down to the Lake's beaches or restaurants and leave the car behind. A 20% discount code for Brittany Ferries is also available. Well behaved pets are very welcome. Please enquire at time of booking. £10 per week fee will apply. You are reminded not to allow pets on furniture or beds. Please do not leave them alone in the cottage. The property is professionally managed by local English speaking property managers and they will be happy to provide you with any further information to make your stay even more enjoyable. Please note changeover day is Sunday during July and August. I am a primary school teacher married to Louise, we have two children of 13 and 14 who still really enjoy staying at the cottage. We have owned the cottage for 8 years and have tried to furnish it how we would expect a nice holiday cottage to be equipped. We bought the cottage because it is close to the lake, restaurants and the cycle track. It is also easy to get to from the UK. The whole lake area is surrounded by the Quenecan Forest, which is privately owned by the Count, (locally known as Jacques). It remains a natural area of beauty. there are even wild boar deep in the forest!. Although privately owned, the Count has has allowed pathways to be cleared through the forest, making it a walkers' perfect for getting away from it all. Le gîte est très propre bien agencé et très bien équipé. Juste un petit bémol sur la télévision car il n’y a que des chaînes anglaises. Le jardin est superbe et tout est très calme. Brittany offers a wealth of varied landscapes - beautiful sandy beaches, deep forests and medieval towns, easily accessible from Lizio's central situation.